when an elastic transducer ( bourdon tube in this case ) is subjected to a pressure, it defects. This deflection is proportional to the applied pressure when calibrated. An elastic transducer, that is bourdon tube which is fixed and open at one end to receive the pressure which is to be measured. The other end of the bourdon tube is free and closed. The cross-section of the bourdon tube is eliptical. The bourdon tube is in a bent form to look like a circular arc. To the free end of the bourdon tube is attached an adjustable link, which is in-turn connected to a sector and pinion as shown in diagram. To the shaft of the pinion is connected a pointer which sweeps over a pressure calibrated scale. Tthe pressure to be measured is connected to the fixed open end of the bourdon tube. The applied pressure acts on the inner walls of the bourdon tube. Due to the applied pressure, the bourdon tube tends to change in cross – section from elliptical to circular. This tends to straighten the bourdon tube causing a displacement of the free end of the bourdon tube. This displacement of the free closed end of the bourdon tube is proportional to the applied pressure. As the free end of the bourdon tube is connected to a link – section – pinion arrangement, the displacement is amplified and converted to a rotary motion of the pinion. As the pinion rotates, it makes the pointer to assume a new position on a pressure calibrated scale to indicate the applied pressure directly. As the pressure in the case containing the bourdon tube is usually atmospheric, the pointer indicates gauge pressure. They are used to measure medium to very high pressures. 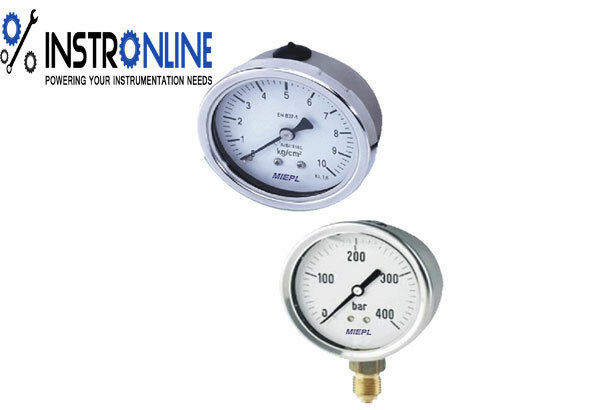 These Bourdon tube pressure gauges give accurate results. Bourdon tube are simple in construction. They can be modified to give electrical outputs. They are safe even for high pressure measurement. Accuracy is high especially at high pressures. They are sensitive to shocks and vibrations. Amplification is a must as the displacement of the free end of the bourdon tube is low. It cannot be used for precision measurement.